The One and Only -- Coach Natalie Randolph from UVA Magazine on Vimeo. 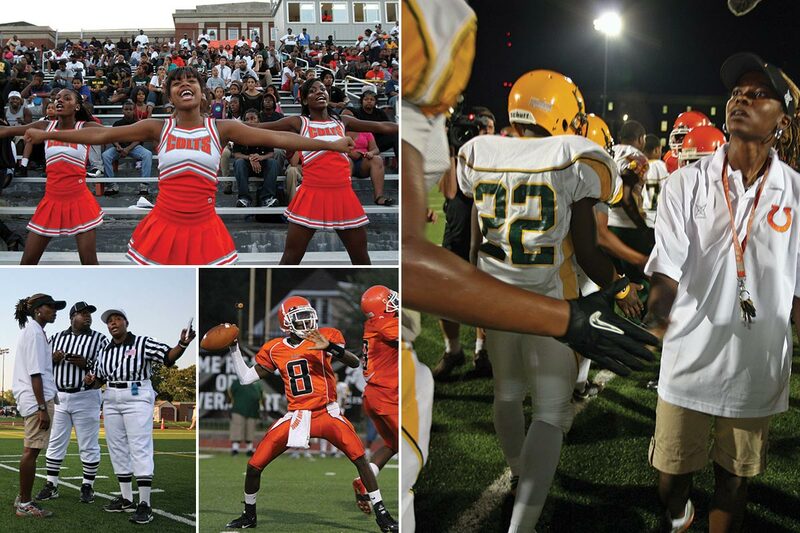 At Coolidge High School, athletes are learning that they need to take academics seriously if they want to play ball—football, that is. Natalie Randolph (Col ’02, Educ ’03) made that clear to a student who approached her the week before the season opener, her debut as head coach of the varsity team.The young man asked to be on the squad. He’s a good athlete—played basketball last season—and Randolph needs good players, but there’s more at stake. 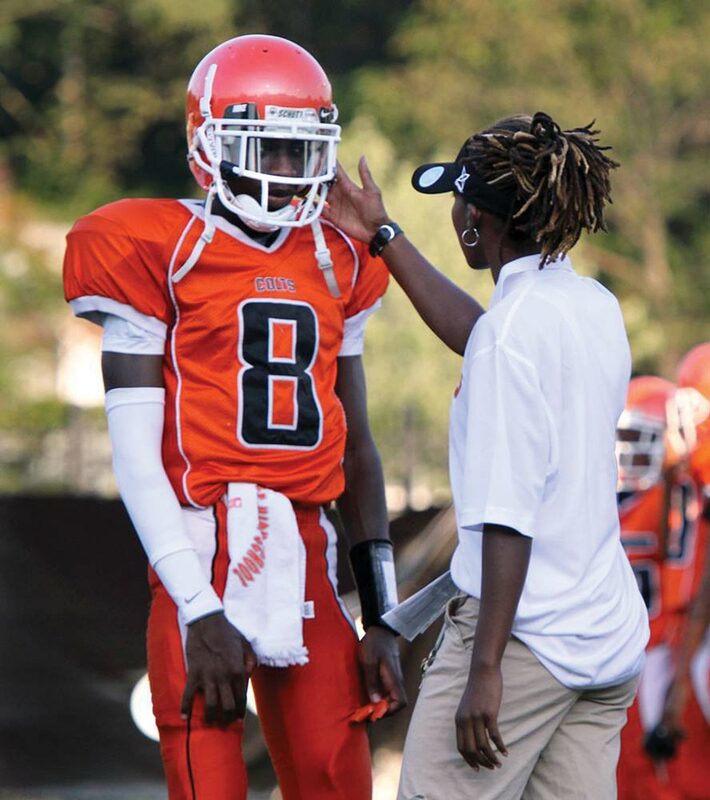 That’s the kind of tough call Randolph knew she would have to make when she accepted the coaching job at Calvin Coolidge Senior High School in Washington, D.C. She knew she needed to change the school’s balance of football and academics. She knew the roster was nearly devoid of starters from the team that went 6-4 the previous year. She knew she would have to assemble a new staff. Most of all, she knew she would be an interloper in a virtually exclusive men’s club. Coaching high school football isn’t something women do. Well, make that past tense. It wasn’t something women did. As if being a woman weren’t enough to set her apart in a man’s world, Randolph is 5-foot-5, slight and soft-spoken. But that doesn’t mean she lacks football experience, either on the field or on the sidelines. She excelled as a receiver and hard-nosed special-teams player for the semipro tackle football Washington Divas of the Independent Women’s Football League. She was an assistant coach at rival H.D. Woodson High. And she has a commanding presence. A quiet word or a hard stare can bring an unruly player in line. Experience aside, she says, “I was surprised that they asked me to think about applying for the job.” She did more than just think about it—she prepared an extensive presentation with color-coded boxes and detailed recommendations. Surrounded by classroom walls that she has painted, Randolph teaches five classes in environmental science. “Teaching consumes my life,” she says. She makes it clear to her players that she prizes what they do in the classroom over what they do on the football field. Randolph demands that her players attend four study halls a week and turn in progress sheets signed by their teachers. West is a National Merit Scholar, and Randolph is talking to Ivy League schools on his behalf. A few players left Coolidge. One was the likely starting quarterback, who transferred even though Randolph had solicited donations from alumni to send him to a summer football camp. Randolph expects extraordinary effort from her players because she knows from experience what such effort can yield. Her track and field career at the University is the perfect example. Randy Bungard, now at Texas A&M, Corpus Christi, was Virginia’s track and field coach at the time. He recalls Randolph’s years as a hurdler for UVA. Randolph’s signature event was the 400-meter hurdles. By her second year, she had come from nowhere to rank among the ACC’s top eight in the event. “I kept working,” she recalls. “I wanted to get a scholarship.” By her third year she was a scholarship athlete. She was a redshirt her fourth year. Then, as a fifth-year student—as she finished work on her master’s degree in foundations of education—she joined the hurdlers at the top of the conference chart. In her final ACC championship meet in 2003, she finished second in the 400 hurdles, outperforming several athletes who had come out of high school highly recruited and marked for stardom. Whatever Randolph does, it won’t be in obscurity. 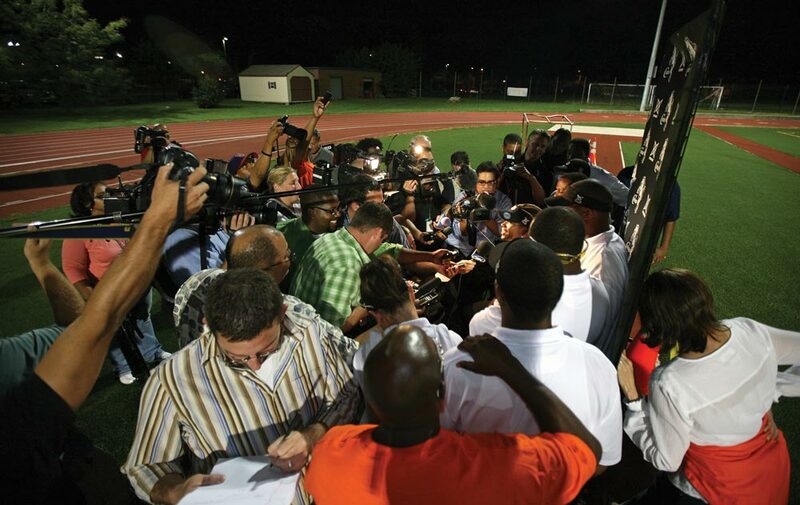 She is a celebrity, the second woman ever to be head coach of a high school varsity football team and the only active one in the country. She was a guest on Good Morning America. ESPN followed her through pre-season practice and the opening game for a feature segment. Parade magazine featured Randolph and some of her players on its cover the Sunday before the team’s first game. Among Randolph’s supporters is 70-year-old Bob Headen, a legendary coach who won eight football championships at H.D. Woodson High. He was Woodson’s athletic director when Randolph was an assistant coach there, and he came out of retirement to be Randolph’s line coach—and her mentor. When the season-opening game arrives, Headen is at Randolph’s side. The two of them, the other assistants and the players do their best to ignore the microphones and cameras that are everywhere. The crowd of about 3,500 dwarfs the usual 700 or so that come to Coolidge Colts games. Randolph’s mother, Marilys, and a cadre of former Washington Divas teammates are in the stands. For more than a quarter, the home crowd likes what it sees. Coolidge dominates. The Colts’ offense moves the ball; the adrenaline-fueled defense turns back visiting Archbishop Carroll. But Coolidge’s palpable eagerness is a problem—half a dozen false-start penalties blunt the offense, and the Colts can’t turn yards gained into points scored. On the sideline, Randolph paces, watching intently. Except for a pained look now and then, her expression rarely changes. 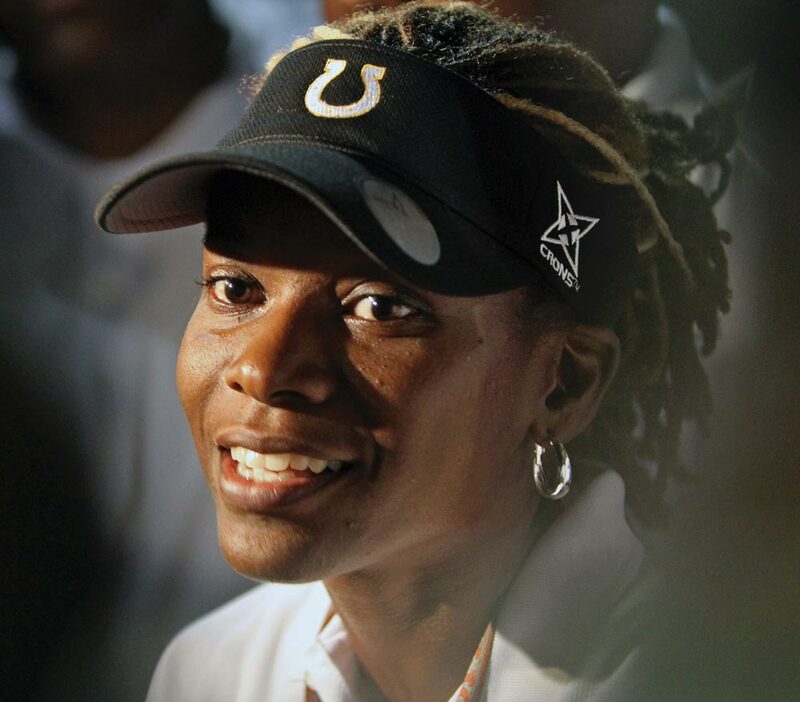 Wearing a visor that corrals her blond-streaked dreadlocks and shades her eyes from the field lights, she shouts an occasional encouragement, confers with Headen and the rest of her staff. On this warm, humid August night, players for both teams suffer from leg cramps. Coolidge—undermanned and with several athletes on the field for both offense and defense—can ill afford to lose players, most notably the Colts’ starting quarterback. The game, which started with such promise for Coolidge, swings Carroll’s way. As time winds down, Coolidge trails 28-0 and the mood is gloomy on the Colts sideline. After the refs quell a shoving match on the field, one battered Coolidge player stomps off and begins to argue with a teammate. Randolph defuses the confrontation without a word. She takes the angry player by his arm and walks him to the bench to cool off. But even in this disappointing moment, there is life on the Coolidge sideline. With only minutes to play and no chance to win, Coolidge junior Joshua Dyson won’t let his team quit. He strides up and down the sideline, exhorting his teammates. “We can’t be beat!” he shouts. “We won’t be beat! We are machines!” Soon many of the Coolidge players join his chant. In the end, though, the 28-0 score stands. One account of the game notes that there was “no fairy tale ending” to the story of the female coach. Randolph shrugs off that notion. Indeed, as of press time in late October, the Coolidge Colts had put together a four-game winning streak. The victories affirm a lesson Randolph preached after that season-opening defeat. Randolph intends to take that philosophy and steer her charges on the kind of path she followed at UVA.